Israeli forces have shot dead two Palestinian gunmen who had entered Israel from the Gaza Strip, the Israeli military said. 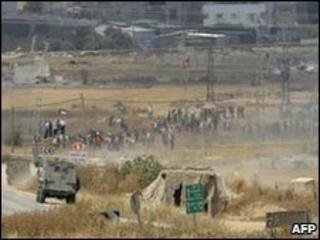 The incident occurred across the border from the southern Gaza Strip. Hamas security officials confirmed that two men were sent on an operation to attack Israel and clashed with soldiers near the border, AP reports. Separately, Israeli air force jets bombed parts of Gaza in pre-dawn raids, but no-one was killed or injured. The Israeli army said the raids were a response to the launching of a Qassam rocket earlier this week. The rocket fell in the Ashkelon region, south of Tel Aviv, without causing any damage, the army said. Israel launched a an assault on the Hamas-run Gaza Strip in December 2008, aimed, Israel said, at halting the rocket fire from Palestinian militants in Gaza. Some 1,400 Palestinians and 13 Israelis were killed in the 22-day war.